Remembering to leave home on rainy days with an umbrella in hand isn't always easy until those raindrops start hitting your poor head, but you can leave those days behind with the Sock Monkey Umbrella! Not only will you remember to bring this guy out with you because he stands out from the rest of the plain looking ones you've got in the umbrella stand, but you'll also get used to all those compliments you'll get on those evenings out on the town when you style on everybody in true Sock Monkey fashion. 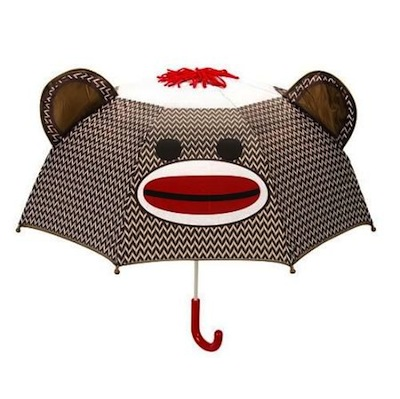 If you've got young ones, buying the Sock Monkey Umbrella is an easy way to get them to use their umbrellas, too! The umbrella measures about 29-inches in diameter. Ages 3 and up.